I am finally in the position to realise my dream of launching Jackie Cam­eron’s School of Food and Wine, which is scheduled to open in January 2015 in Hilton. The first step was being awarded a level three IVQ advanced diploma in teaching, training and assessing learn­ing by the City and Guilds of London Institute in 2010. The process has been in my head since before then, but now that I’m fo­ cused entirely on my school, things are slowly falling into place and I’m taking every day as it presents itself. There are many questions to be answered and eve­ ry day is an adventure of discovery. The school will offer an 18 ­month, intensive, internationally­ recognised course with a maximum intake of 15 stu­dents. “Hands­ on” is my philosophy and the students will be working alongside me daily. The school will provide students with the opportunity to experience all things foodie in a safe and secure envi­ronment. I believe there is no need to have worked in a top restaurant, locally or internationally, to succeed. There is so much to food and I want to share all that I have been fortunate to have learnt and experienced with the students. My aim is to impart this knowledge, and to equip the students with the skills to “go it alone”. Think new age on all levels - teach­ ing the students how to create a balanced and healthy lifestyle in this crazy but extremely rewarding industry. At the moment I am doing as much as possible by myself. This gives me the opportunity to know and understand what each position in the business re­quires and to ensure I get the correct people to fill those positions when the need arises. As I go through what I have achieved and what is still on the list, I think abun­dance, so I have chosen prosperity as the theme for this month’s column. First up is Millionaire’s Shortbread. When I was younger I could only eat one piece at a time - unlike my sister who could flatten an entire tray in one sitting. She had a sweet tooth of note. Shortbread, caramel and chocolate glaze; it's what sweet dreams are made of! Pound Cake made me think of the English pound sterling. Its strength against the South African rand makes a trip to the UK very expensive... But, back to the recipe which com­prises a pound each of butter, flour, eggs and sugar - actually equal quantities will do just as well. I remember often having this at my grandparents’ homes. It’s so versatile - any flavouring can be added to reinvent the very plain, traditional cake. I was recently introduced to Prosper­ity Cake and I’m pretty excited to try it. This is what I read about these styled cakes, also called Fa Gao Chinese New Year Cake. The cake is steamed and, when cor­ rectly made, the top should split open into a smile - the bigger the smile the better the fortune. Preferably it should split into four sections. Gao means cake in Chinese and Fa means leavened, so the name describes the cake. However, Fa also means pros­perity, hence the name Prosperity Cake, and the reason it is eaten during Chi­nese New Year - to bring luck for the coming year. Angel Cake is a very light sponge cake originating in the United States and be­ cause of its lightness is said to be “food for the angels”. I added a little cocoa powder to add a slight variation to the norm. I have been served Copper Penny Sal­ad and I enjoyed it but this is the first time I have made it - expect a few changes to the traditional recipe. I was paging through a local newspa­ per recently and came across an article in which a nine­ year­old mentioned it would be his dream to meet me. I contacted him immediately. It later transpired that I met Dhiryarv at a cooking competition in Ballito where the two of us were guests. It was heart­warming to meet a young person with such enthusiasm, creativity and determination. He told me about his last demonstra­tion where he cooked 'Pot of Gold'. As he said, "Why would anyone want plain white rice?”. I’m excited to watch him grow and hopefully enrol him into my course in the next few years. Please spread the word; and anyone interested to know more about Jackie Cameron’s School of Food and Wine should e­mail me directly. I have been overwhelmed with requests for short courses and evening classes. This will all come but my focus is on the 18­ month course, right now. 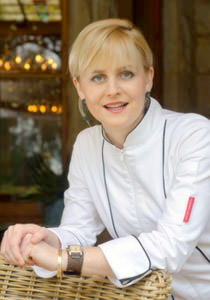 I look forward to hearing from you and to educating aspiring young and 'young­at­heart' chefs. There is no re­ward that can be as satisfying as uplift­ing and developing another human be­ing. To teach someone is to educate for a lifetime. May spring bring warmth and sun­ shine into your life! Congratulations to our KZN Food Heroes!